AED Signage Available Online At Real Response! Order One Today! Convenient and reliable storage for your Cardiac Science G5 or G3. Be sure that your unit is safe and secure, whilst also being able to locate the device in an easy to access area for quick emergency response. Includes clear AED signage to identify you defibrillator. The number one killer of Australians is sudden cardiac arrest. Lack of education means that people are not aware of the causes, symptoms and treatment, as well as the huge difference that a defibrillator can make to the chance of survival. 15,000-20,000 Australians die from sudden cardiac arrest each year. Numbers are not exact because of misdiagnosis and erroneous reporting. For example, someone who experiences serious trauma such as extensive injury causing blood loss or drowning may suffer from sudden cardiac arrest. It isn’t only coronary heart disease that may cause such an attack. This can be explained by looking at the actual cause of a sudden cardiac arrest and its effects on the body. Sudden cardiac arrest is the sudden stopping of the heart. This failure to function is caused by the heart’s electrical system malfunctioning, causing arrhythmias (the heart beating too fast, too slow or erratically). When the heart does not ‘beat’ blood cannot flow around the body to the vital organs, most vital of which is the brain. The brain cannot survive for long without oxygen. In fact, irreversible brain death occurs between 4-6 minutes after a sudden cardiac arrest. A sufferer will likely collapse with no prior warning, although those with a history of heart disease or heart condition may experience pain, dizziness or lack of breathe. They will lose consciousness and stop breathing. The only known treatment for someone suffering a sudden cardiac arrest is CPR and the use of a defibrillator. A defibrillator will give the body a shock to normalise the rhythm of the heart. Its electrodes read the arrhythmia and applies the electricity as needed. Every minute without the use of a defibrillator causes the victim’s chance of survival to decrease by 10%, however if applied within the first minute of an attack, the chance of survival soars to 70%! 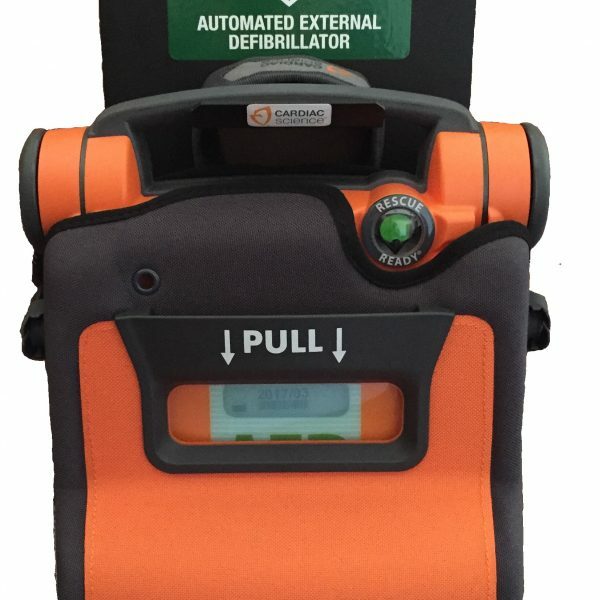 Your defibrillator will be a compact, light-weight unit with bright colouring and lettering on the device and AED signage. Defibrillators are made to be as simple to use as possible, often with only one button required to start and activate. Your unit should be kept in an easy to reach place with clear AED signage. By placing your defibrillator on a wall you can keep it out of the way of everyday activity without having to shut it away where it may be forgotten. You can also locate it in whatever space is the most accessible from any area of your organisation/home to reduce the time it takes for a responder to get to the device when it is most needed. A cupboard or drawer for your unit it not required! Simply screw the bracket onto the wall along with with the AED signage, and place your defibrillator within it.